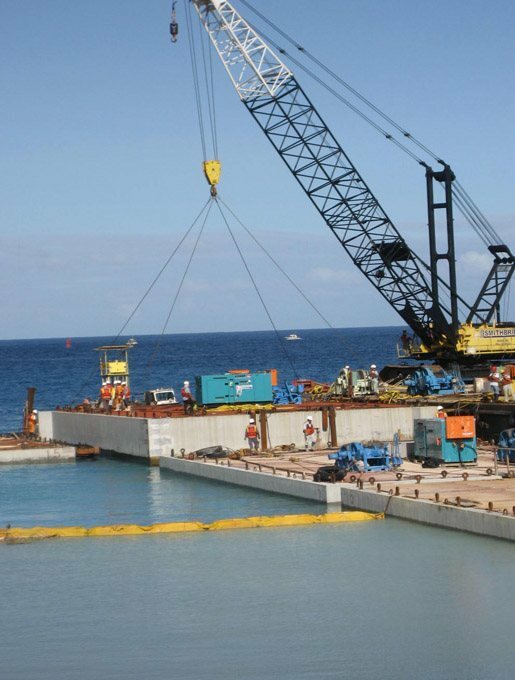 SIMCO’s concrete expert services were retained to perform durability testing and field quality control of the caissons fabricated in Japan for the Kilo Wharf Extension project in Guam. Kilo Wharf, located in the outer Apra Harbor, is the Department of Defense’s (DoD’s) primary and most strategically important ordnance facility within the Pacific fleet area of operations. 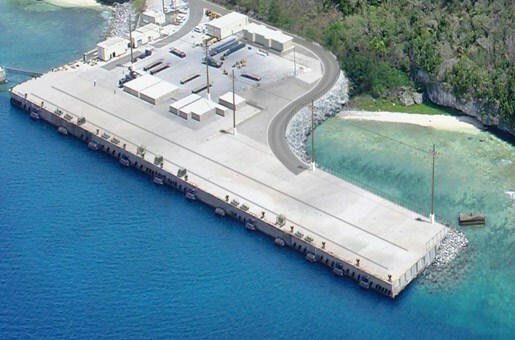 The Navy’s project to extend Kilo Wharf was to provide adequate berthing facilities to support a new class of ships that would replace existing ships deployed at the time. To ensure Kilo Wharf met facility planning criteria for Navy and Marine Corps shore installations, the U.S. Navy specified the use of SIMCO’s STADIUM® predictive modeling software to determine the concrete service life of the Kilo Wharf extension project in Guam. This performance-based specification called for a 75-year service life of the various reinforced concrete elements before major restoration and with minimal maintenance. SIMCO’s scope of work included durability modeling of different concrete elements (e.g. caissons, piles, deck) using SIMCO’s STADIUM® methodology in order to predict the time before corrosion initiation. STADIUM® was also used to identify the optimum concrete mixture to be used to provide the 75-year service life specified by the U.S. Navy. Results from simulations performed were incorporated into the project specifications and provided guidelines for the concrete properties. SIMCO also monitored the quality of concrete production during the construction phase. The specifications stated that the service life of the extension had to exceed 75 years and that the initiation of corrosion should not occur before 65 years. Concrete properties were obtained from samples cast during the fabrication of the caissons and if samples were not in accordance to required specifications, production was halted until remediation strategies were implemented. SIMCO’s analysis results provided the owner with reliable and useful information regarding the performance and durability of the kilo wharf extension. The U.S. Navy specified SIMCO’s STADIUM predictive modeling tool to determine the service life of the Kilo Wharf extension in Guam. This performance-based specification called for a 75-year service life.